Preparing for this article on a year in the life of ThinkGenetic required the collection of statistics about financial and content contributors, website visitors, research and development activities, and partner activities. 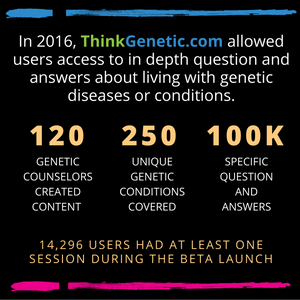 I was surprised by how much we accomplished, but more importantly, by how many people contributed to getting ThinkGenetic to where it is today. 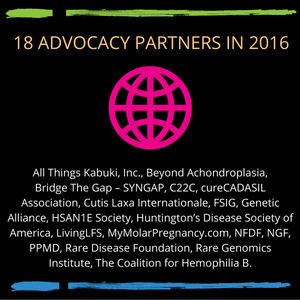 Thousands of patients and patient advocates helped keep us focused on our goal of helping reduce the time to diagnose genetic diseases and to provide actionable answers to questions about living with a genetic condition. We received invaluable help from 120 genetic counselors from around the world who created questions and answers for about 250 genetic diseases. This huge effort was managed by ThinkGenetic co-founder and Genetic Counselor, Dawn Laney and her crack team of co-workers at Emory University’s Department of Human Genetics, including Robin Vinson, Clinical Research Coordinator, Michael Gambello, MD, Section Chief of Medical Genetics at Emory and several genetic counselors. Graduate students in Emory University’s Genetic Counseling program were another source of invaluable assistance. Morgan Simmons Master’s thesis on ThinkGenetic users and their actions on the site accelerated the creation of the ThinkGenetic data collection infrastructure. In additional to Dawn’s team at Emory, we leaned heavily on medical writer Robert Tomaino and our pharmacist and advisor to the pharmaceutical industry, Carol Ogg, to ensure content was accurate and written to the right reading level. Making content easily available to website users was the responsibility of ThinkGenetic’s lead architect Peter Wilkerson and his team of staff and contract developers. It has been more than 18 months since initial design work began on what would become ThinkGenetic.com. Peter was responsible for taking the vision of what ThinkGenetic CEO Dave Jacob and co-founder Dawn Laney wanted to achieve and create an intricate system of components that would allow a team of content creators to efficiently compose and edit content, feed and train IBM Watson, integrate the industry Human Phenotype Ontology (HPO) and the ThinkGenetic SymptomMatcher, convert clinical signs to everyday language, and finally bring it all together in an intuitive and beautiful user experience. Like all good leaders, Peter keeps a firm grasp on his design vision and surrounds himself with a brilliant team of developers to help him bring the vision to reality. Nearly all site and component coding work has been done ridiculously quickly by Justin McGarvie. Russell Weller has done all user interface (UI) design. He and Peter have spent countless hours talking through the best way to make ThinkGenetic.com easy to use. Taylor Cassidy has provided invaluable assistance in improving the natural language processing that allows site users to get accurate answers to the medical related questions that they type into the site. Apache Solr plays an important role in searching for answers at ThinkGenetic.com and Xavier Muguruza lent his expertise in the advanced Solr configuration that our site required. Finally, our wonderfully reliable, fast and scalable website is built on a server infrastructure designed and supported by Amandeep Singh. Thanks to the hard work by this wonderful cast of characters in both content creation and development, ThinkGenetic.com was opened to the public on June 30, 2016. Ruth O’Keefe and her team at Rokkit Marketing, a member of the ThinkGenetic family of companies, then began aggressively promoting the ThinkGenetic image. 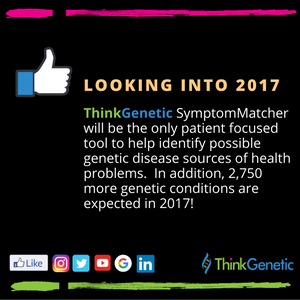 Critical to achieving our goal of reducing the time to diagnose genetic conditions is letting the world know that answers to questions about genetic diseases can be found at ThinkGenetic.com and that the ThinkGenetic SymptomMatcher will soon be there too. This task can be divided into two parts. Ruth does a terrific job at keeping ThinkGenetic active in social media, email marketing and at industry conferences. Outreach to patient advocacy groups, a wonderful co-marketing experience, also helps spread the message about ThinkGenetic. Daniel Jacob, Dave Jacob, Dawn Laney, Ruth O’Keefe and Carol Ogg have all actively assisted in this area. With increased awareness comes increased web traffic and a self-sustaining stream of revenue from the pharmaceutical companies, genetic testing laboratories and healthcare providers that benefit from helping provide solutions to the health problems people living with many genetic disorders suffer from. While our revenue grows, we are grateful for other forms of financial support that has kept our vision alive and well. 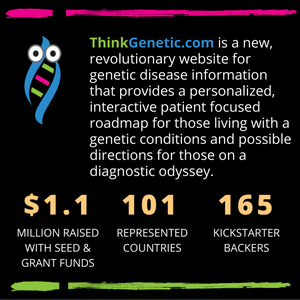 The earliest funding for ThinkGenetic came from three grants. Shire and Pfizer each provided an investigator-initiated research grant to perform academic research via Emory University to ThinkGenetic. Similarly, The Legacy of Angels Foundation (TLOAF) provided a two-year grant via Emory. Additional funding was then provided by a Kickstarter campaign with 165 donors; Jeff Griffor, John Hoey and Gary Butter (all early believers in our team and mission); and most recently by a large angel investment by Boston area-based investor Ted Pasquarello. This investment has positioned the company well for major expansion in 2017. A Series A round of equity investment is planned for the Summer 2017 timeframe. This infusion of cash will expand our covered diseases to 3,000 by year end along with adding additional languages and allow us to add additional ingestion points (e.g. medical records) into our SymptomMatcher. We believe that a for-profit ThinkGenetic will be able to generate revenue and attract investment that we could not hope to approach as a non-profit. That will allow us to create life-changing solutions for people living with a genetic disease. However, it is equally clear that a non-profit entity has many advantages when it comes to providing no cost educational services and assistance to those with a genetic disease that are in need of financial help. Because of that, the non-profit ThinkGenetic Foundation was formed in November 2016. The ThinkGenetic Foundation is expected to receive its IRS 501(c)(3) designation in the Spring of 2017. At that time the Board of Directors of the Foundation, on which Dave Jacob serves, will announce additional services that they will be providing. Thanks to thousands of supporters, ThinkGenetic is now providing help to the 350 million people living with a genetic condition worldwide. In the last six months of 2016, ThinkGenetic.com was visited by people from 101 countries seeking answers to their questions. I would like to personally thank everyone that has helped us provide such a valuable service and to invite anyone that wants to be involved in 2017 to fill out a contact form at ThinkGenetic.com or contact me directly. Kudo’s to all of you for creating such a wonderful resource! Thank you for your support, Michelle!